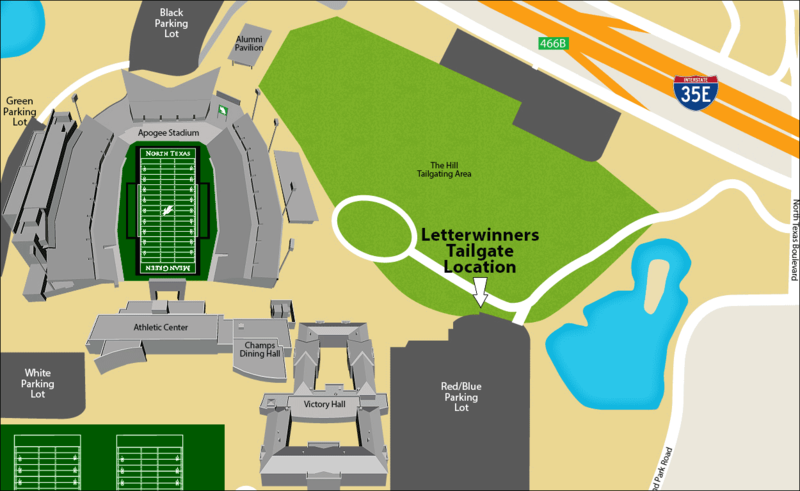 The Letterwinners Association will tailgate before Mean Green home football games on The Hill east of Apogee Stadium (see map below). Admission, food, and drink are free for all active members. Just check in at the Letterwinners table at the tailgate location. Letterwinner guests can purchase a tailgate meal ticket for $5 at the check-in table. If you have any questions about the Letterwinners Association, please contact Hank Dickenson at 940-565-3339 or by email at Hank.Dickenson@unt.edu. To access Letterwinners Association ticket benefits, such as discounted game tickets or Letterwinners event tickets, call the North Texas Ticket Office at 940-565-2527 or ticketoffice@unt.edu. The North Texas Letterwinners Association is on Twitter and Facebook. Follow us and let us hear your comments and concerns.